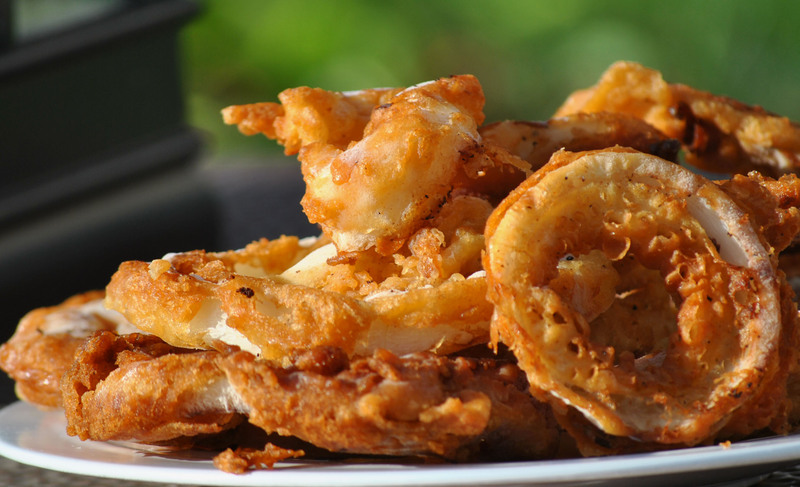 Do you like onion rings? My husband loves them. He thinks of himself as a onion ring expert. As far as I know, if it’s on a menu, my husband will try them. Personally, I’m more picky when it comes to onion rings. I suppose you can think of me as firmly in the camp of liking them. I don’t love them, that’s for sure. I also only like certain kinds. My husband, on the other hand, really enjoys the onion rings from White Castle. Do I need to say more? Does that paint a pretty good picture in your mind? Months ago we were out and about shopping. We stopped in my favorite store, Williams Sonoma, and they were sampling onion rings. I’ve already shared with you my husband’s love of the rings, but he also loves free samples. The man loves Costco on the weekend for the samples. I don’t sample. It’s a germ thing, for one. It’s also my marketing background. I know what they are doing, and although I applaud it, I don’t want to be sucked in to the whole thing. All food is good when presented in the right light. 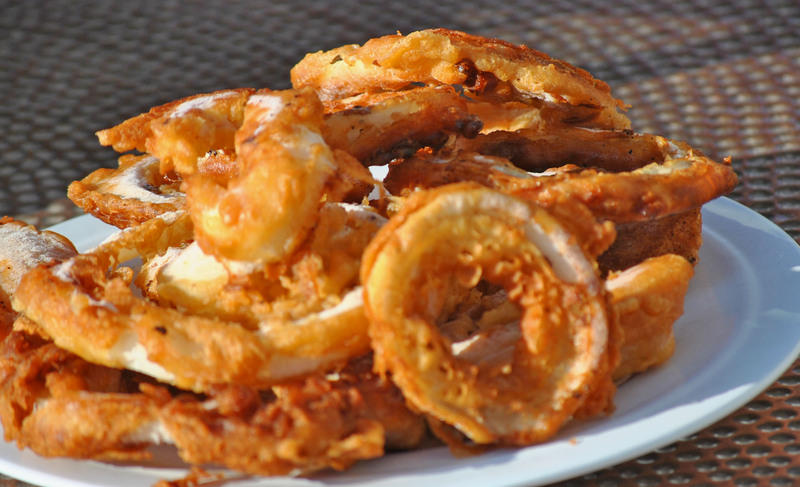 We came home from shopping and my husband would not stop talking about those onion rings, and because he’s mine, I made them. And made them. Seriously, these are so tasty. The recipe calls for buttermilk and I’ve made it with and without. I also don’t drain the onions in a colander. I just keep them in the milk until I’m ready to add them to the batter. Place the rings in a large ziplock bag and add enough milk/buttermilk to coat them. Seal the bag and refrigerate overnight. 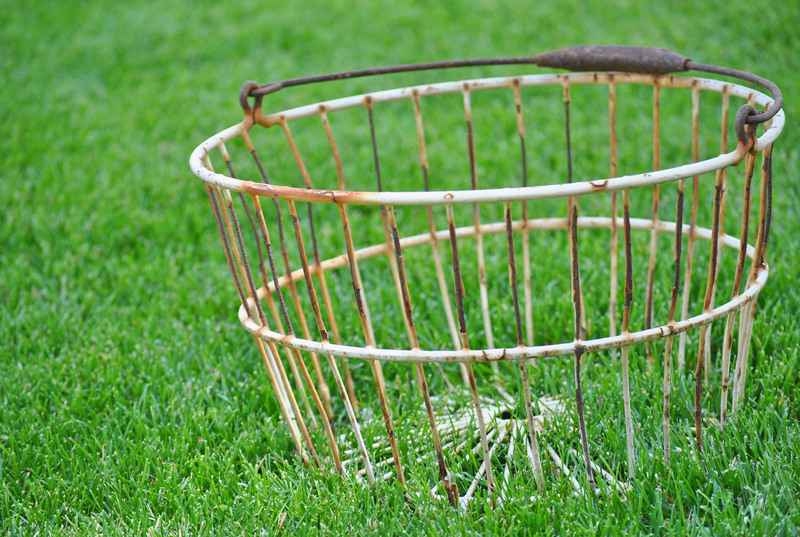 Prep a deep frying pan with enough oil to fry the onions. In a large bowl, whisk together the flour, cornstarch, salt, and baking soda. In another bowl, whisk together the eggs, mustard and beer. Add the egg mixture to the flour mixture until it is a nice thick batter. Drain the onions in a colander. I don’t do this, I keep them in the bag until I’m ready to dip them. I just let them drain well before dipping. Place a handful of onion in the batter and stir to coat. Remove the onions, one at a time, and let the excess drip off. Add the rings to the pan and fry, turning occasionally. I add about 5 to 6 rings to the pan, depending on their size. Don’t over crowd the pan. Fry for 3 to 5 minutes, until golden brown, and then transfer to a paper-towel lined baking sheet. You can sprinkle with additional salt, if desired. I don’t. 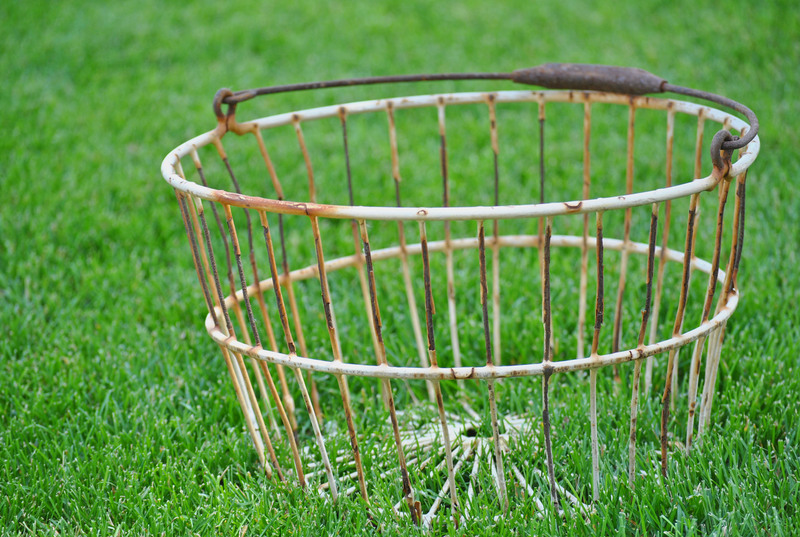 These pair well with hamburgers, hot dogs and a great panini. Or serve them as an appetizer with your favorite dip. We like our dip with mayo, french dressing and horseradish. These make a generous amount of onion rings that easily freeze. Reheat the leftovers on a cookie sheet in a 350 degrees oven for 10 to 15 minutes, if the rings are still frozen adjust your time. We had big plans on Saturday. My husband and I decided that we would spend the day in Michigan. When he was a boy, his family had a cottage in Michigan and we were going to visit the area of his childhood. Really, we wanted to go to a particular place in Michigan for the day, enjoy a wonderful lunch and come home. Meeshie was really excited. Her geography lesson for this week has been Michigan, and as she looked at the map she penciled in the apple house and restaurant. Generally I don’t tell her too far in advance any plans we make because plans change and I hate to disappoint her. This was one of those times I wished that I had stuck with that plan. We found out on Friday that the apple house and restaurant had closed. I’m not sure how long it’s been closed, but one of my husband’s co-workers told him he saw a for sale sign out front when he was in the area a few weeks ago. So we went to the show and saw Super 8. We also planed to pitch the tent in the back yard, but the rain threatened. We promised Meeshie we would work the tent in sometime next weekend. As a consolation to Meeshie’s weekend let down I made a wonderful watermelon treat. 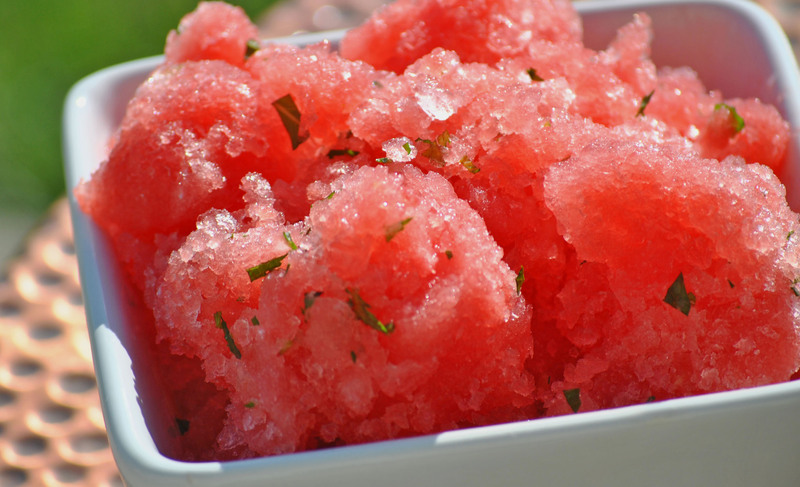 Who doesn’t like iced watermelon? This recipe is so simple and can easily be adapted for an adult version with alcohol. This is a refreshing treat that Meeshie has requested for her birthday celebration next month. I loved the hint of mint. This is a perfect dish to serve instead of ice cream. The weather here has been all over the board. Really hot one day, rainy and cold the next. It seems like we are heading it to some warmer weather for the next few days. Perfect for this iced dish! In a saucepan, combine the water and sugar. Heat until the sugar has completely dissolved. Remove from heat and cool completely. 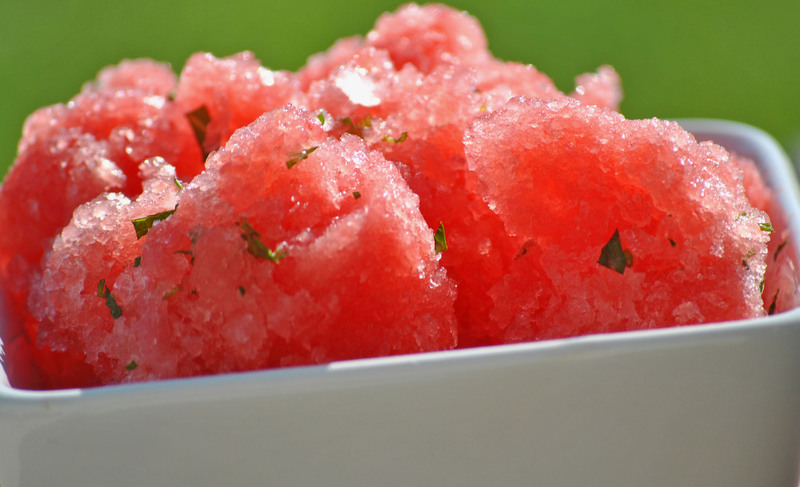 While the simple syrup is cooling, blend the watermelon in a blender until smooth. In a large bowl, combine the watermelon, simply syrup, lime juice, and alcohol (if using) until combined. Pour the mixture into a shallow baking dish for 2 hours. Remove from the freezer, and use a fork to scrape the mixture to form ice chunks. Add the chopped mint and return to the freezer for another 1-2 hours. If you leave it in the freezer overnight, allow it to sit out for a few minutes before you scrape it up and serve. Oh Yeah It’s Caramel Time! I’ve been making a really great treat lately. It’s so simple. I love that everything I need is in my pantry. I made it again after dinner last night because I was looking for something sweet and I whipped this up. Have you ever browned butter before for a rice krispie treat? Try it next time and enjoy the flavor. The browned butter gives this treat a wonderful caramel flavor. 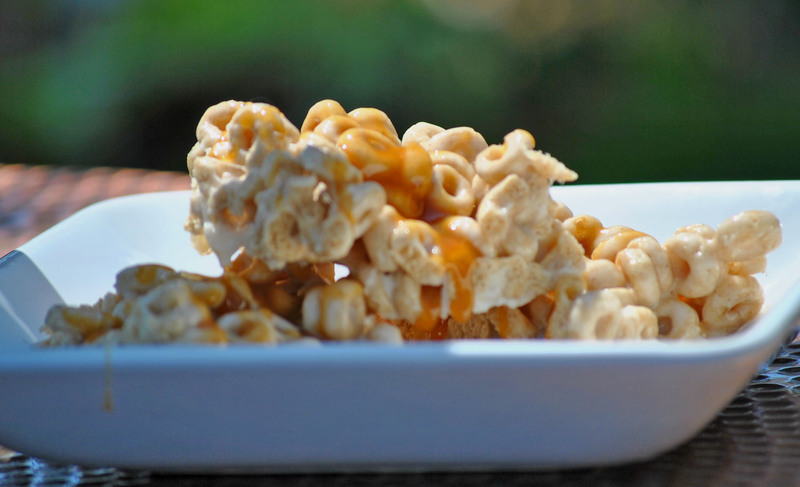 This recipe is a great twist on a rice krispie treat, except you use Cheerios. 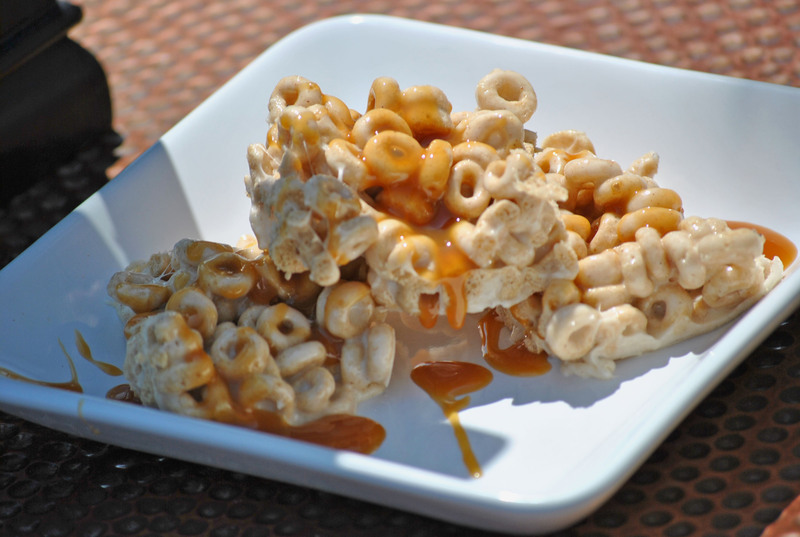 This recipe actually calls for Cinnamon Cheerios, but my store doesn’t carry that flavor.The addition of the cinnamon and caramel just add another layer of delicious to this easy treat. In a large saucepan, melt the butter. Heat over medium heat until brown and has a nutty aroma. While heating, keep a close eye on the butter to prevent it from burning and stir it frequently. Once the butter is browned, turn off the heat. Add the marshmallows, cinnamon and salt. Stir until the marshmallows have melted and then add the cereal. Spread the cereal mixture in the prepared pan. Press the mixture down into the pan. Drizzle with caramel sauce and sprinkle with additional salt. Let cool and cut into bars. Here is the original recipe. I really love this site. She has some really great recipes. My friend Kathy sent me this wonderful recipe. As soon as I saw it I knew I needed to make it for today. I’ll admit that the amount of lemon zest made me do a double take. I thought it might be too overpowering. Not so! Kathy said it was so refreshing and different. I totally agree. She also said it was a bowl of deliciousness. It’s a perfect pairing to any summer gathering, BBQ, or mid-week meal. I would really like to give this a try with raspberries, blackberries, or blueberries. Or all the berries together. This dish is really making me wish it was July. July is, of course, blueberry picking. I have fresh blueberries in the freezer from last year, but they would be too soggy, and because I have so many pounds in the freezer I can’t break down and buy any at the store. I do know that my next trip to Costco will definitely include raspberries and blackberries. Oh and after enjoying some grilled meats and various sides, this dish is going to taste wonderful with some sugar cream pie. 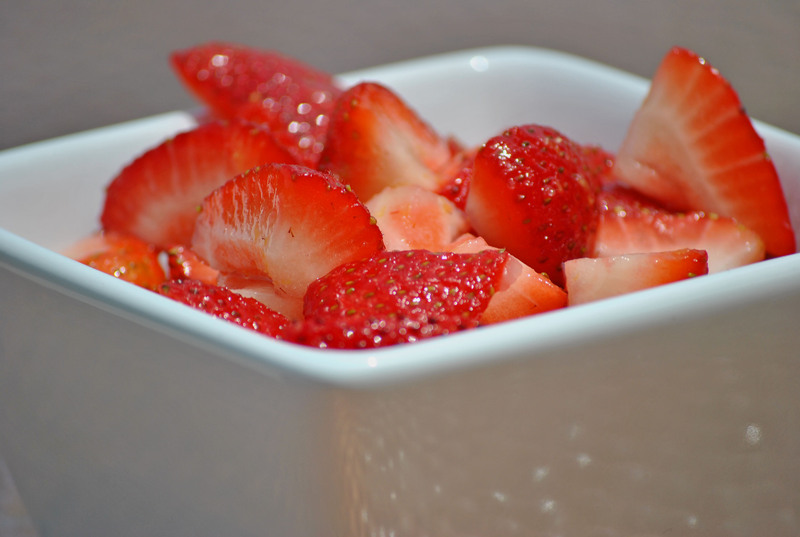 Place the strawberries in a bowl. Zest the entire lemon on top of the berries, then juice the lemon into the bowl (roll the lemon on the counter before juicing to maximize your juice yield). Add the sugar and stir. This will serve about 6 people. I found this recipe for this really awesome puff loaf and when I read the post it had me nodding my head. It started something like do you ever wake up in a baking mood? I do. I do a lot. Baking is one of my favorite things to do. I like to do other things, of course, like read or run, but baking is tops on my list. I love this coffee cake because it also reminded me of cream puffs or eclairs. Have you ever made either of those treats? They are really simple to make, but the reason they are so puffy is because of the cooking technique used. You make a flour paste on the stove and slowly add eggs to the paste and then bake the mixture. The technique is what gives the pastry its puffiness. It has a crunchy layer on the bottom and then this great puff layer. So good. When I made this, we ate it for breakfast. Don’t judge, I did that on purpose. Besides, you’ve never eaten coffee cake for breakfast? Yes you have. It’s designed to be eaten with your coffee. 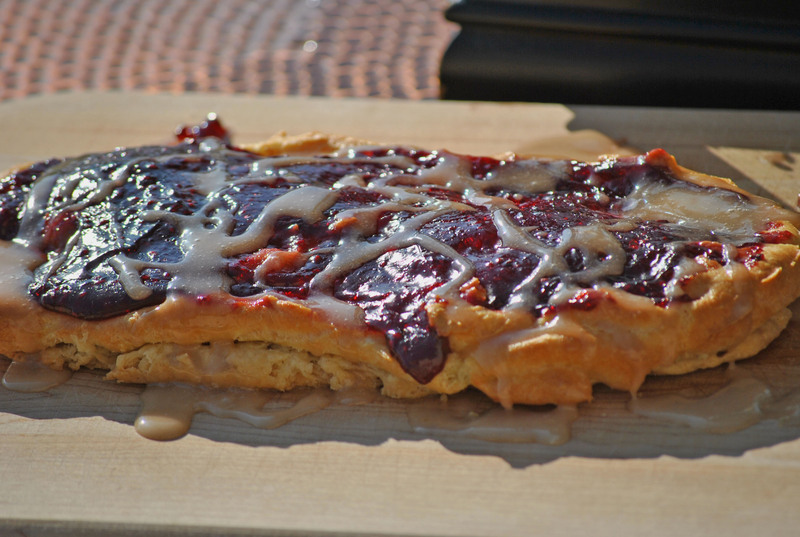 2/3 C Pastry filling (Solo) of your choice-I used raspberry, but use whatever you like. Apricot would really be good with this. Preheat the oven to 350°F. Line a large cookie sheet with parchment paper. First layer: In a medium-sized mixing bowl, combine the butter, flour, working the butter into the flour with a pastry blender or fork, your fingers, or a mixer. Mix until everything is crumbly, then stir in the water. The dough will become cohesive, though not smooth. Divide the dough in half and place on the prepared cookie sheet. Shape each piece of this wet dough into a rough log. Pat, the logs, with a rubber spatula, into 10″ x 3″ rectangles on the sheet, leaving at least 4″ (but preferably 6″) between them, and 2″ on each side. These puff up in the oven (hence the name), and you need to leave them room for expansion. Second layer: In a medium-sized saucepan, bring the water and butter to a boil. Stir until the butter melts, then add the flour all at once. Stir the mixture with a spoon until it thickens, begins to steam, and leaves the sides of the pan; this will happen very quickly. Set aside for at least 5 minutes. Transfer the dough to a mixing bowl. Beat it at medium speed for 30 seconds to 1 minute, to allow it to cool down some more. I actually beat the mixture by hand with a whisk during this stage-everyone was sleeping and I didn’t want to wake them. Add the eggs one at a time, beating well after each addition; beat until the dough loses its “slimy” look, and each egg is totally absorbed. Mix in the almond extract. Divide the batter in half. Spread half the batter over one of the dough strips on the pan, covering it completely. Repeat with the remaining batter and dough. With a rubber spatula spread the batter until it completely covers the entire bottom layer of dough. Smooth it out as best you can. Bake the pastry for 25 minutes. After 25 minutes remove from the stove and spread the pastry filling equally over each loaf. Return the coffee cake to the oven and continue to bake for another 25 minutes. You may have to cook them for another 10 minutes (the total cooking time is between 50 minutes to 1 hour), they should be a deep golden brown and puffy when done. 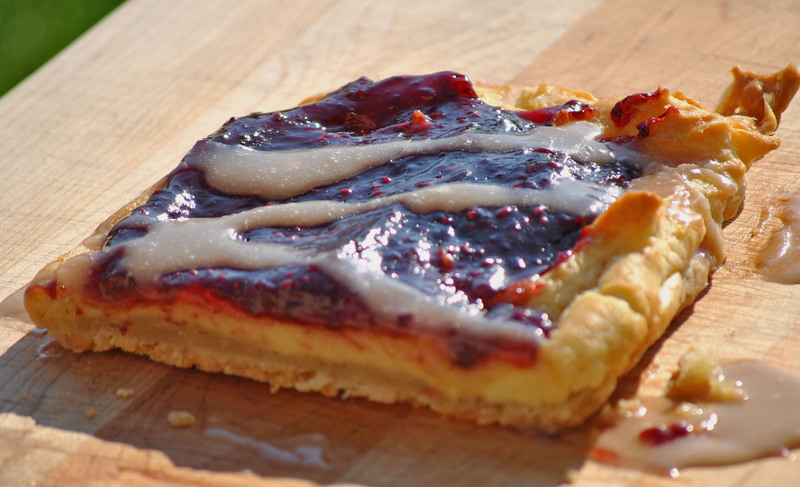 Remove it from the oven, and transfer each pastry to a wire rack. Topping: Mix the sugar, almond extract and milk together. Drizzle on the warm coffee cake. 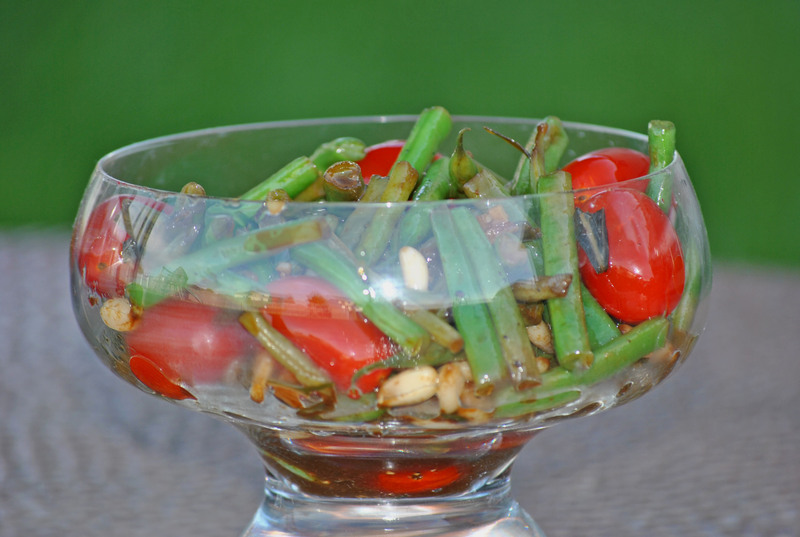 I found this recipe for warm green bean salad in an issue of Everyday Food. It was a suggested that the salad be served with steak. I made it with a thin sirloin strip steak that I had cut in 4-inch strips. But this salad would be great with chicken breasts or some salmon. The recipe called for a can of cannellini beans which I didn’t have, so I added the pine nuts. It also suggested that the tomatoes be added when you add the garlic, but my husband is not a fan of warm tomatoes, plus when you add the tomatoes to the warm green beans, they do get warmed through. I loved the flavor of this salad. 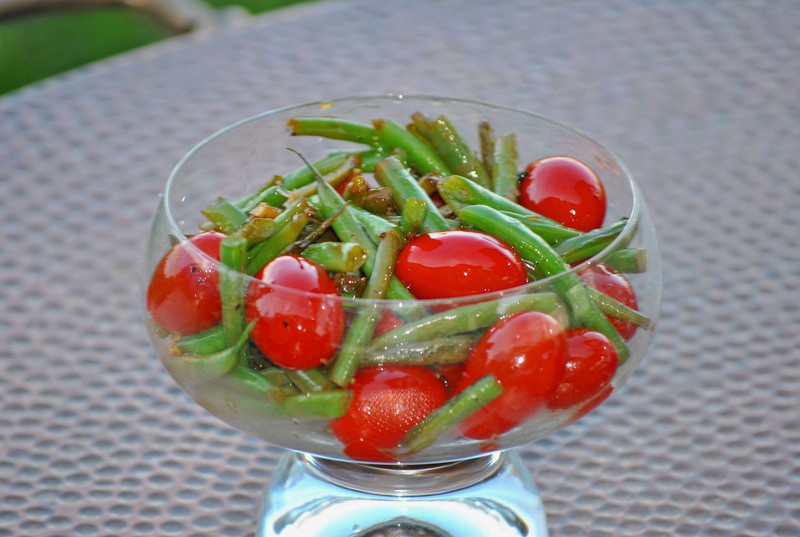 I loved the use of the green beans. My husband and Meeshie loved it too. Fresh veggies served in a way that everyone loved? That’s a win in my book! Oh, and did I mention it is one of those dishes that is done in no time? The salad only took about 15 minutes from start to finish. 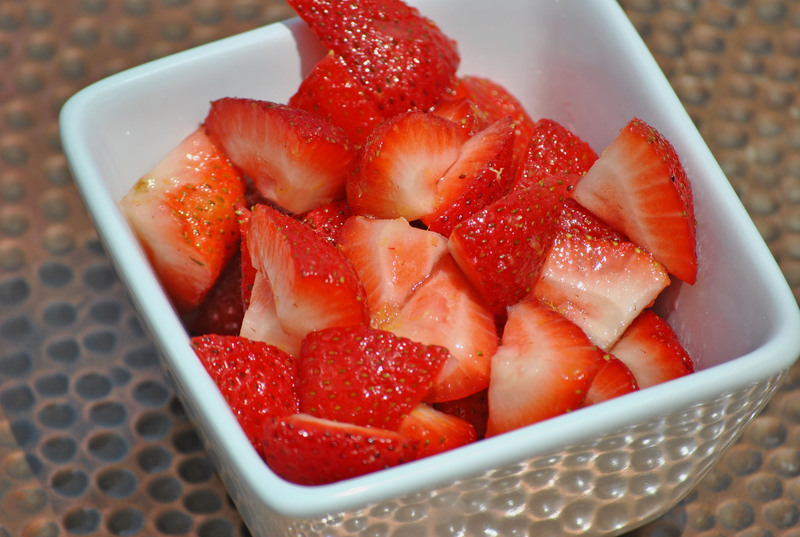 Love something tasty and quick during the week, especially during the summer. Next time I make this I’m going to throw it all on the grill. I recently bought a wonderful cast iron pan from Crate and Barrel that would work really well for this recipe, but then in the summer there isn’t too much I won’t cook on the grill instead of using the stove. 3/4 lb Green Beans, trimmed and cut into 1-inch pieces. Heat the oil in a skillet. Add the green beans and cook for 2 minutes. Add the garlic and the pine nuts and cook for another 3 minutes, keeping an eye on the pine nuts so that they don’t get over brown. Add the vinegar, tossing thoroughly. Remove from the heat, add the tomatoes and basil. Toss in a bowl, add truffle salt and pepper to taste. You are currently browsing the Meeshiesmom's Blog blog archives for June, 2011.